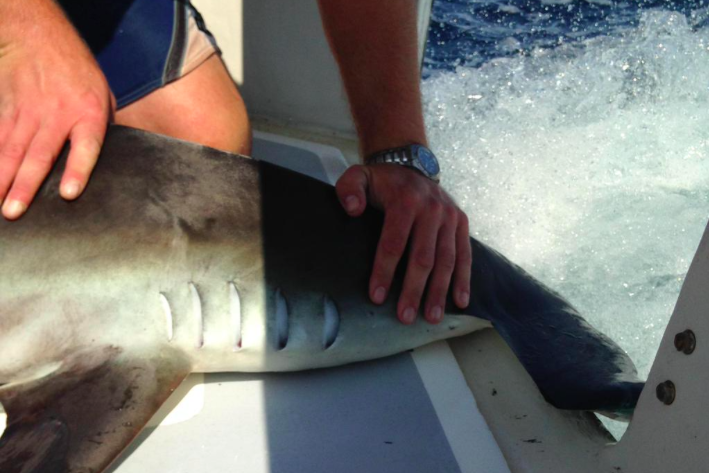 Elias, a 100-pound hammerhead shark, was recently tagged by OCEARCH. Elias, a 100-pound male hammerhead shark who was recently tagged by OCEARCH, has been exploring the Jersey coast over the past week, making a stop in Belmar Sunday morning and Lavalette Monday. A tracker placed on the shark's fin records its location when the fin breaks the surface. The tracker then sends out a "ping." Since he was tagged on July 19, Elias has traveled a total of 439.9 miles, according to the tracker. On Sunday, he "pinged" just miles off the coast in Belmar at 7:22 a.m.
On Monday morning, Elias had made his way to Lavalette. OCEARCH also tracks the whereabouts of Mary Lee, a 3,000-pound great white shark who was spotted along the Jersey Shore in May.